Once again, another Conference of Parties is here, and once again, it is time to talk, talk and talk. Though the COP 17 is not the first COP held in an African soil (COP 12 was held Kenya in 2006), this one by and large is the much talked-about COP in Africa, hence dubbed as the Africans COP. But the questions which remain are 'What make COP 17 really an African COP? What is unique about it?' Is it only because it is held in Africa and that’s it!! Or does organising the COP in Africa really mean the outcome of the negotiation will favour Africa’s agenda? Can South Africa, the incoming president really steer the negotiation to make it swing in favour of Africa? Is the outcome of the discussion going to be as usual, a simple COP decision without any binding targets or this time round would it be a fair ambitious and a legally binding one? Is this year’s COP going to be different from that of 2009, where few powerful countries meet in a green room, put up negotiating text, tailored to suite their selfish national interest then ask the world to accept what they decided? Or is COP 17 going to be a COP, where leaders make franks talks, having the threat of climate change at the back of their minds and then make a COP where parties big or small unclenched their fists for national interest to a global climate treaty that is needed to salvage the planet and the future generation? Well, these are questions that needs urgent and decisive answers yet many a time there is none. So the world once again sit and wait, and as usual hoping for the best but expecting the worst. 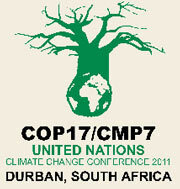 The COP 17 ends on the 9th December 2011 and then we shall know what our leaders have put on the table for us. While we are waiting, fingers-crossed, we want to reflect on what we think should constitute a successful COP or otherwise, in the eyes of African youth. First, we want to join the African group stand at the negotiation and want to say them, louder and clear, that we are behind you. As young people, representing the future, the generation that will inherit whatever decision is reached, and living in Africa, the continent that is most vulnerable and has less capacity to adapt, we are equally perturbed by the slow pace to act by those countries that are able, and in fact responsible for the current predicament of the changing climate. We are now tired of the hide-and-seek and business as usual of talks that lead us nowhere. The COP is such an expensive under-taking that we can longer accept the lack of progress to reach a definitive agreement for global emission reduction. So, it’s time to act. In a recent interview of Tosi Mpanu, the chief Negotiator of the African group under the UNFCCC with leaderhiponline, said that Africa has high respect for the Kyoto protocol, Africa will not comprise with the life of the KP, the only legally binding instrument that requires those countries most responsible for causing climate change to reduce pollution. We welcome this tough stand and are happy that our leaders and us think alike. We have no doubt that with a united African front this is achievable, however, we are equally worried that annex 1 countries will use their divide-and-rule tactic which they are very good at, to get an easy way out. We hope that the respective African countries will not be lured again to comprise their concerted efforts for big promises that are often not fulfilled. What we want to see now is tangible commitments that is legally binding and support climate financing needed to curb the climate crises. Funding for climate change based on bilateral agreement cannot just work for Africa and should not be accepted. We therefore join Mr.Tosi and the general African group to ask for tangible outcomes from Durban that is based on science that is fair and that honours the promises all countries have made to each other in the UN Climate Convention and its Kyoto Protocol. Unlike the mainly perceive death of Kyoto protocol in Durban we expect nothing less extension of the KP to another commitment period, after the current commitment expires in 2012. This agreement need to be reach in Durban in order to avoid gap. Parties need to agree to a level of co-operative global efforts that cut emission to a safe level for Africa and other developing nations. And hence we want implore on all parties to agree to global emission reductions well below 1.5 degrees Celsius. We want the finance gap to be closed ensuring that the developed countries meet their commitments to enable the adaptation and mitigation efforts in developing countries that is clean and not following the annex 1 countries development pathway. In addition we want to see, capacity building, climate Education integrate into central focus on negotiation. This may look to be a tall demand for many critics but we stand firm until these demands are met. We have Faith!!! Ebrima S. Dem, youth climate activist. He is the climate change focal person for the Network of African Youth for Development, advisor, Climate change Education specialist and member African youth Initiatives on climate change ( ayicc). He is currently the National Coordinator of Global Unification the Gambia. He can be contacted on climateinfo@nayd.org. I don't think the signs are looking good. I really hope I'm wrong. President Obama’s US administration will not contemplate binding limits on pollution because of fierce opposition from Congress.....and Obama is under pressure to keep everyone happy to ensure he gets re-elected. If the US won’t back legal limits, neither will Russia, Japan, China or India, leaving only Europe in favour of them. Is political survival more important than saving the planet? Thank you for your comment.. I have been following this climate debate since 2009, but it seems that we not heading to any thing possitive.. The COPs have been turn to annual festivals for willy talks and money spending ventures..what do you think is the reason of the UNFCCC organising COP 18 in Doha, one of biggest polluter and almost the most fossil fuel dependent country on earth...? Its money, nothing else.. Beside all what negotiators come after two weeks of talk is just a "Gate way" . A gate way to what..? in Durban there was only "platform" which platform? I think the UNFCCC should stop playing with words and lead countries to really, equitative solution. where this not possible let them step aside, shelf this so call talks and we all get doom!! !